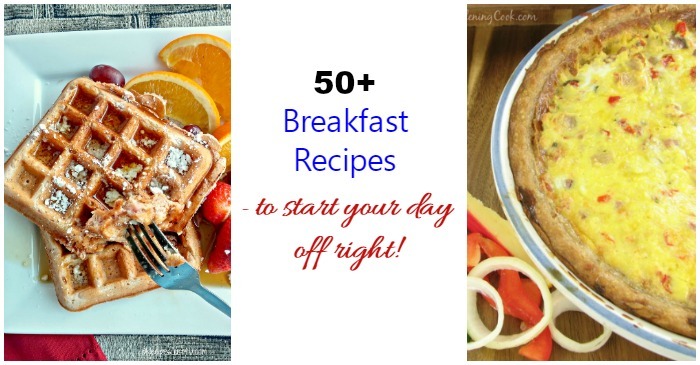 It really can be easy and fast to start your day off right with a great tasting breakfast recipe. From a quick and easy muffin recipe to a hearty and substantial meal with all the fixins, most breakfast recipes can be on the table in about 30 minutes or so. Some of these ideas are light and tasty for those who are watching their weight. Some are perfect for those busy mornings on the go, when it’s a “grab and go” type of breakfast moment. And then there are others that are full out “kitchen sink” recipes that would be perfect for a brunch on the patio overlooking the garden with friends and a mimosa (or two!) Whichever you choose, all are tasty, look special and will start the day off in a great way. We are pretty much all in a hurry in the morning, so why all the fuss about making sure we get a good breakfast? Studies show that having a good breakfast can add to a nutritionally balanced diet, give you vitamins and minerals that might be lacking and help you concentrate more and have more energy all day long. Banana Nut Breakfast Bars – Almost like dessert for breakfast, but shhh we won’t tell! Blueberry Energy Bites – Perfect with a quick cup of coffee or juice. Buttermilk Cornbread Muffins – Great tasting on their own with home made jam or add to one of our more substantial breakfast recipes. Caramel Apple Buttermilk Muffins – Yummy, sweet and full of the fresh taste of apples. Chocolate Peanut Butter Muffins – The creamy peanut butter center makes these muffins really special! 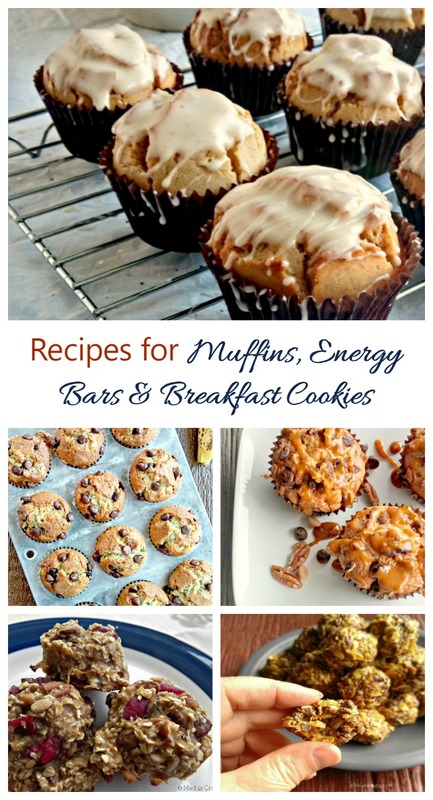 Cinnamon Apple Muffins – Only 102 calories and 2 WW Freestyle points in each of these full sized muffins. Eggnog Muffins – Who says that eggnog is only for the holidays? Hearty Banana Nut Muffins with a Streusel Topping – The topping makes these muffins. It is crunchy, sweet and so yummy. Lightened up Chocolate Chip Oatmeal Muffins – These have been lighted up with applesauce instead of oil. Paleo Banana Nut Muffins – No added sugar or wheat and much more healthy than normal muffins. Rich Chocolate Chip Caramel Muffins – Sweet and decadent, and perfect for Mother’s Day! Tasty Banana Chocolate Chip Muffins – If you have some ripe bananas, turn them into this tasty breakfast treat. Vegan Coconut Oil Banana Muffins – Perfect for those who follow a Vegan diet. Bananas Foster Oatmeal Bowl – Caramelized bananas are the secret to this tasty and filling bowl. Caramelized Mushroom Breakfast bowl – Whole30 compliant, gluten free and Paleo for a healthy start to the day. Crustless Chicken Quiche – Dairy Free, Gluten free and Whole30 compliant but just full of flavor. Easy Breakfast Egg Muffins – Perfect for a busy morning on the go. Gluten Free Egg Cups – No crust – just use sliced turkey for the wrapping. Grain Free Muesli is the perfect Paleo or Whole30 Start to your day. Healthy Breakfast Granola – All the crunch without all the fat of normal granola. This Whole30 Breakfast Bowl is chock full of good ingredients. Lightened Up Egg McMuffin – A healthier version of the fast food breakfast. Oven Baked Grapefruit – Warm and toasty with a cinnamon and brown sugar topping. Slimmed Down Breakfast Pizzas – English muffins and Canadian bacon keep this breakfast recipe light. Stove top Granola – So much better than the store bought kind!. This Gluten Free Banana Bread is also sugar free. Healthy eating at its best, and Paleo, too! Tired of eggs on the Whole30 plan? Try this delicious Whole30 Apple and Coconut Breakfast bowl. It’s ready in just minutes. Whole30 Bacon Frittata – This delicious breakfast recipe has only 94 calories but is full of flavor. Yummy Egg White Crustless Quiche – Perfect for those watching their weight. Bacon, Egg and Vegetable Breakfast Muffins – Hearty, easy and very pretty on the plate. Bakery Style Jumbo Chocolate Chip Muffins – For those who like a REALLY BIG muffin! Breakfast Hash browns – hearty, filling and so tasty. Chicken Breakfast Hash – Perfect breakfast bowl and so hearty. Chocolate Chip Pancakes with Peanut Butter Syrup – Decadent, rich and out of this world good. Coconut Crusted French Toast – This recipe takes normal French toast to a whole other level! French Toast Breakfast Casserole – This one cooks in the crock pot overnight! Greek Omelette with Artichokes and Feta Cheese – A Mediterranean delight for breakfast. 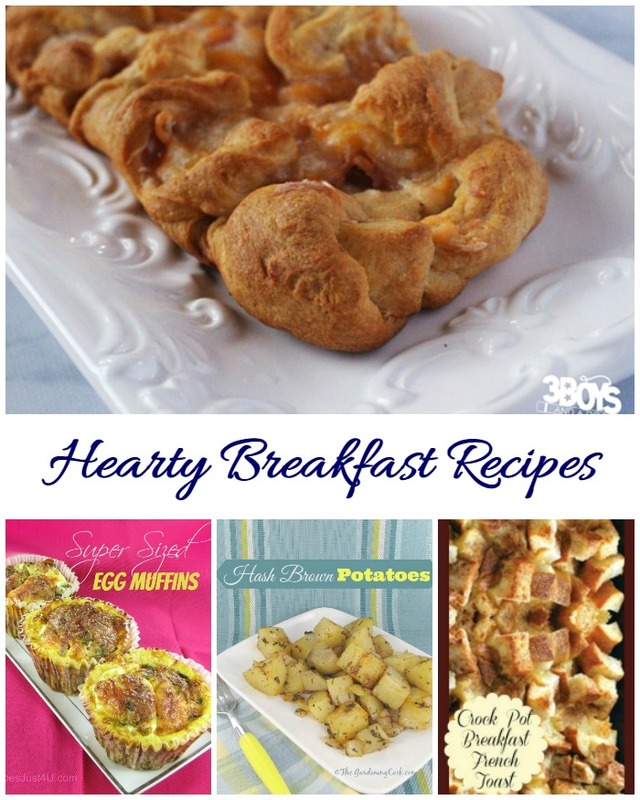 Ham and Cheese Breakfast Pastry – It’s a meal on its own! Loaded Breakfast Casserole – This amazing casserole is easy to make but just full of flavor. How to Make Perfect Pancakes – Tips and tricks plus 25 Pancake Recipes! Mushroom and Caramelized Onion Omelette – The vegetables make this one taste amazing. Strawberry Belgian Waffles – Perfection on a plate and pretty to boot! Tasty Banana Pumpkin Pie Spice Waffles – Tasty, easy and perfect for that special brunch. 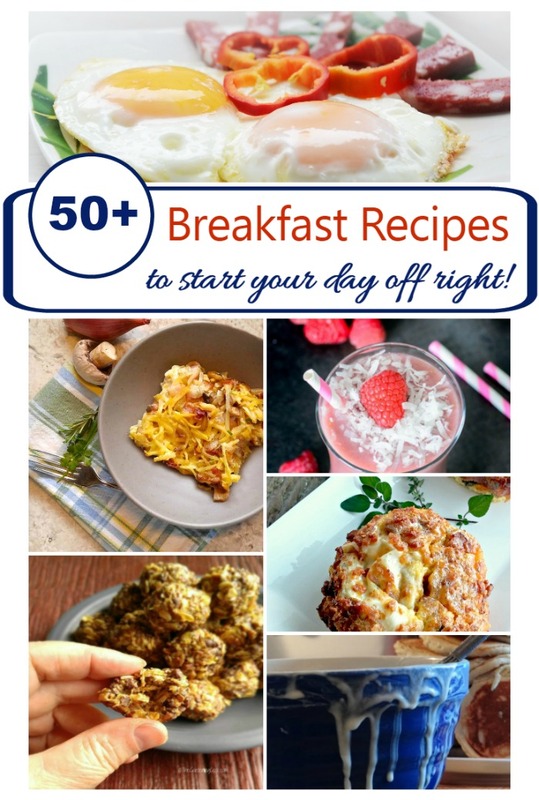 Whole30 Breakfast ideas – 10 recipes to start the day in a healthy way. This Whole30 Turkey Hash is a great way to use up leftover Turkey! Blood Orange Mimosa – Brunch with a boozy twist. Chocolate Peanut Butter Smoothie – Feel like the taste of a peanut butter cup in a drink? Gluten Free Muesli Banana Smoothie – Quick and tasty with a nutritious punch. Mango Pineapple Smoothie – Fresh and sweet – delicious for summer. Paleo Nutella Smoothie – This rich tasting smoothie has just a few substitutions to make it fit into a Paleo diet. Enjoy summer with this Raspberry Coconut Breakfast Smoothie recipe. Spicy Bloody Mary – The traditional breakfast drink that is perfect for Cinco de Mayo. This Easy Strawberry Smoothie is breakfast in a glass! Watermelon Raspberry Lemonade – A summer time cooler that can be made with or without the alcohol. Breakfast is more interesting if it is varied from day to day. Having a few tools on hand will allow you to make those Belgian Waffles and Pancakes just right. Here are some of my favorite Amazon picks for breakfast tools. You may not be able to afford them all at once, but just keep adding to your breakfast tools and you’ll soon be cooking like your favorite brunch cafe. 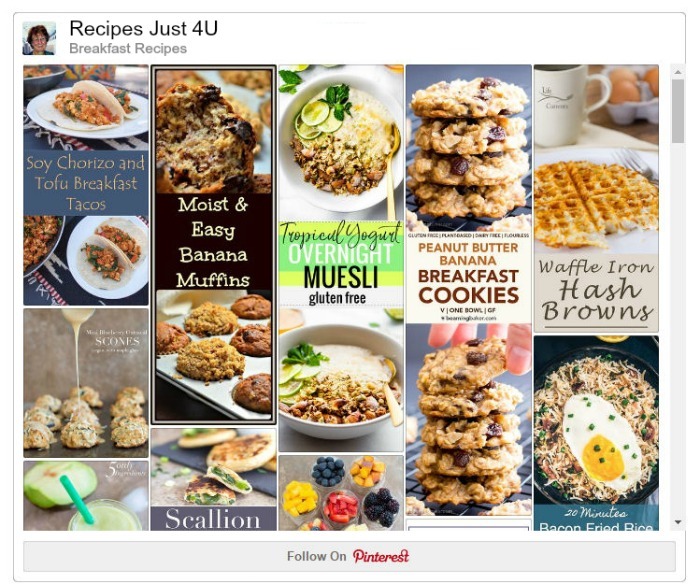 Need more ideas for Breakfast Recipes? 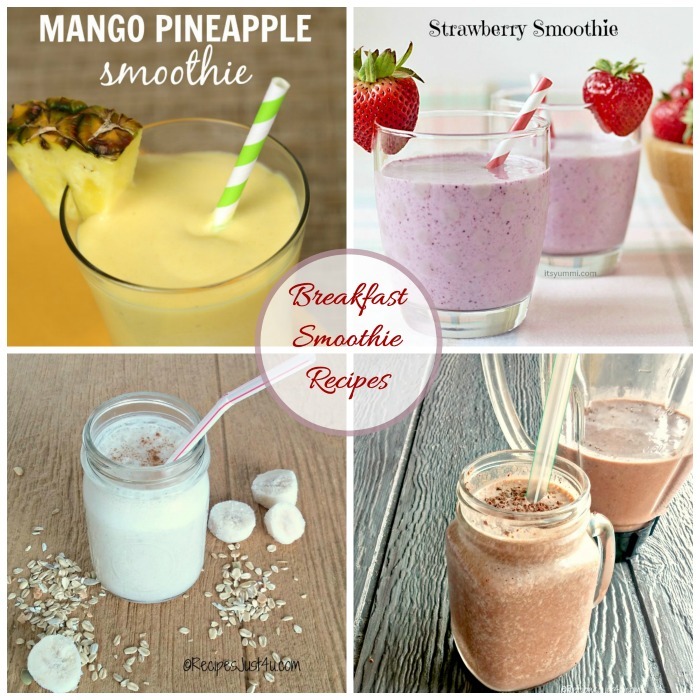 Head on over to Pinterest to visit my Breakfast Recipes Board.